Despite the stronger than expected ABS housing data released yesterday, it increasingly looks like residential property prices peaked in late 2017. The bull market in property has seen prices rise from circa AUD $12,500 in 1970 to AUD $686,700 today, a total return of over 5000%. The Great Australian dream indeed, though one that may have run its course. On top of that, we have the Royal Commission into our banks, plus a likely change of government, with a Shorten led Labor movement promising to end negative gearing tax concessions for established housing, and halve existing capital gains tax concessions for property investors. Little wonder house prices have begun to head lower. In terms of how far they could fall, a famous Reinhardt and Rogoff study from 2009 found that the average housing market crash saw prices drop 35%, and last six years. If that happens Down Under, the value of our housing market would drop nearly AUD $2.5 Trillion. 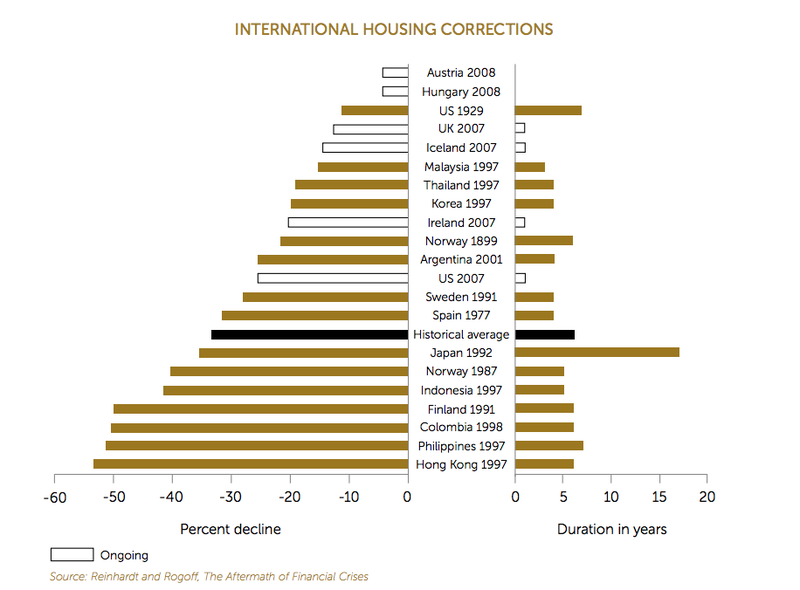 Our view is that Australia, should we go through a housing bust, likely won’t see such a significant decline, though a correction of even 20% (which would only set Melbourne and Sydney prices back to where they were in 2014/2015 as an example) would be devastating for the country, tipping us into a recession, stripping us of our AAA rating and causing significant pain on the ASX, given the absurd weighting of financials in the index. Whilst saving in cash might seem the best way to side-step a housing correction, we know the RBA would likely respond with even lower rates for longer, making even this an unpalatable option. 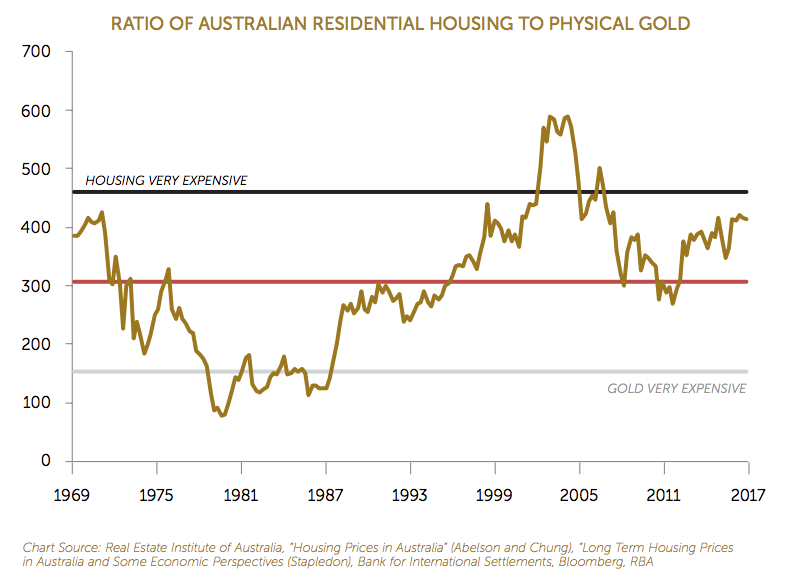 Physical commodities like gold on the other hand would likely prosper in such an environment, with a long-term chart of the value of Australian housing measured in ounces of gold suggesting the yellow metal is exceptionally cheap on a relative basis today, and set for considerable outperformance. All that and more in this detailed look on Australian housing and the potential end of the boom! Access the full document here.